The Tornado Tournament 3000 Foosball table is a high quality table featuring all the advanced features and top-in-the-line foosball table. It is designed keeping in mind the serious foosball players. It is all the way similar to the Tornado Platinum Tour Edition used in the world wide tournaments. The only difference is that it is not operated with the help of coins. Check here for more reviews! The surface of the table is overlaid with Brushed Aluminium Laminates. The exterior logo placards comes in a variety of colours. The handles which the players use is exactly similar to those Foosball Table available in the major tournaments. It is also provided with Game and Match score counters. These counters help one in keeping track of their progress in the particular match and the overall game as well. It is equipped with patented three piece bearings. These bearings are used to enable very smooth linear and rotational movements. The smoothness is achieved by reducing friction and handling stress. The players are counterbalanced with each other. Hence, it becomes amazingly easier to play. The table comes with a red ball. It is precisely ground and provides perfect play atmosphere. One of the best feature which makes Tornado Tournament 3000 very unique in its field is that it comes with a positive 9 ball drop. It offers a clear playfield trim. 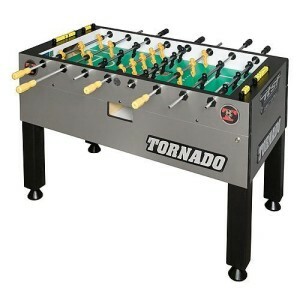 There are plenty more features available in the Tornado Tournament 3000 Foosball table which makes it the king in its market. This Foosball table features four solid legs. These rigid legs provide extra convenience and stability for the players while in the play. Each of the four legs are further powered with leg levellers. These leg levellers are easily adjustable. One can use the leg levellers to adjust the height of each leg to help the table rest flat on the ground and balanced from all the sides. The Tornado Tournament table is not a single big compartment. It is split into two separate boxes. This helps for the table’s easy shipping and assembly. The playfield in this model of the Foosball table is more than three fourth of the complete table. The build is made up of thick commercial grade material. The split design further helps the players during intense playing sessions providing perfect rigidity to any sort of tough moves. In addition to all the protective features of the table, the table in designed to effectively match the rugged plays. The durable end protectors act as an extra safety feature. The logo graphics in this table are designed in a bold phase. The steel rods are hollow which help players in performing the movement with utmost ease. During the manufacturing process, the steel rods are heat treated. This process results in high strength. The steel rods are also protected with a chrome plating over it. The rod is so precisely manufactured that the gameplay is very smooth. The other creative feature of the Tornado Tournament 3000 Foosball table is that it comes with a scoring unit. The scoring unit is basically an Abacus Scoring Unit. Using this scoring unit, the players can keep a track of their game and match scores. The scoring unit, therefore, increases the intensity of the competition which in turn results in interesting games. The three piece bearings are separated by a thin wall. This further enhances the ball control and perfect blocking of shots by the opponents. It is based on the Single goalie model. The players are perfectly counter balanced. This allows players see no hindrance while in the game. The Tornado players are patented. They come with sharper corners. The cross section of the players are also increased in this model. These two features help in amazing ball control and passing. 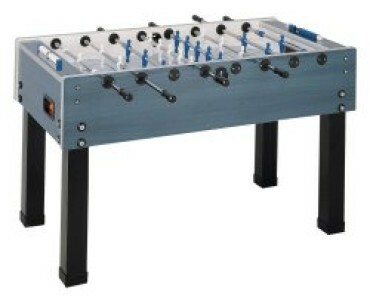 This Foosball table is usually shipped in two fairly large and heavy cartons. It is recommended to have at least two strong persons to lift the packages, once the order arrives at one’s doorstep. The assembly is just a simple put together. The men, rods and handles come together while the shipping arrives. It requires assistance of two persons. One just need to attach legs to the bottom part of the table and then attach the top to the bottom of the table. Noteworthy, it is quite difficult to assemble the top half to the bottom. Hence, it is better to take help in attaching the top half to the bottom. Once the assembly is completed, it provides hours and hours of fun for kids as well as adults. In comparison to the light weight Foosball table, this table is heavier and rigid. Irrespective of the intensity of the play, this heavy weight table stays at one place. One can easily lower the level of the legs by just adjusting the levellers. The silky and smooth bearing further reduces the efforts we need to put to adjust them. The polished and smooth playing surface increases the pace of the play drastically. With all the above mentioned features, the Tornado Tournament 3000 price is worth the one pay for it. 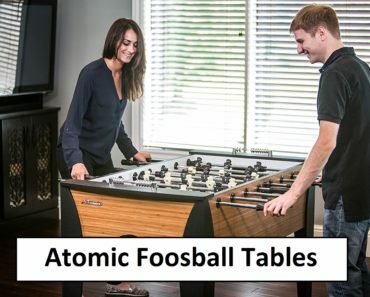 If one needs to own the best Foosball table which can last for a lifetime and provide hours and hours of fun and entertainment, then one need not look any further. The Tornado Tournament 3000 is the best choice. 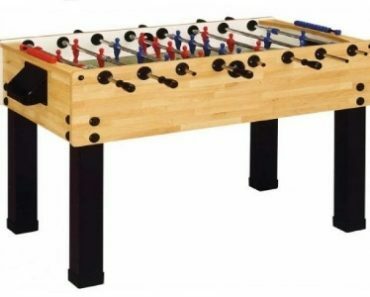 Each and every feature in this Foosball table screams of durability, quality, smoothness and greatest possible fun.